Kaitlin Vortherms, a graduate student in ASU’s School of Sustainable Engineering and the Built Environment, is shy, bookish and somewhat reserved in social situations. Given those traits, the last place you’d expect to find her is in a pageant requiring a talent performance, an on-stage interview, a private panel interview and swimsuit and eveningwear displays. But that’s exactly where she was last November when she was crowned Miss Phoenix 2015. So how did someone who likes to avoid the spotlight end up in an official preliminary competition for Miss America? Vortherms’ colleague Lauren McBurnett, a fellow ASU graduate engineering student and Miss Cave Creek 2014, suggested the pageant would be good for Vortherms’ personal growth. Vortherms had reservations and, she admits, held stereotypes about the pageant and its competitors as too concerned with looks over substance and intelligence. But she decided to enter, and the experience proved those stereotypes wrong. Prior to the pageant, Vortherms attended multiple workshops put on by the local pageant director to help contestants prepare for the interviews and public speaking. Ultimately, she also feels the experience has prepared her to be a better engineer. “My engineering education has been fantastic for a lot of things, but one thing it hasn’t taught me to do is to present myself and talk publicly about things I am passionate about,” says Vortherms. Improving such skills among engineers and scientists is one of the goals of the Center for Nanotechnology in Society at ASU, where Vortherms is a fellow. Such skills also help scientists and engineers connect with a broader public, enabling them to identify their research’s real-world relevancy – or lack of it. The Center for Nanotechnology in Society brings in fellows from ASU's Ira A. Fulton Schools of Engineering and the Biodesign Institute to work with researchers to produce scholarship that isn’t possible from just engineering or just the social studies of emerging technologies. Vortherms’ research addresses the need to reform engineering education to include more social and emotional intelligence. “These are the qualities that engineering education is insufficiently imbued with,” says Thomas Seager, associate professor and Lincoln Fellow of Ethics and Sustainability in the ASU School of Sustainable Engineering and the Built Environment and Vortherms’ adviser. Vortherms is exploring the role of empathy in engineering, an interest sparked by an undergraduate trip to Uganda. She traveled there with a group of engineering students to build a solar thermal energy generation trough. During the project she recognized the disconnect that can happen when products are designed in a locale vastly different from where they will be used. Upon her return to ASU, Vortherms took a new class being offered in the communication of science and engineering. Taught by Boyd Branch, visiting assistant professor in the Herberger Institute School of Film, Dance and Theatre, the class used improvisation to help students develop their presentation and communication skills. Together they developed a master’s program to study the role of empathy in engineering, teamwork and design. 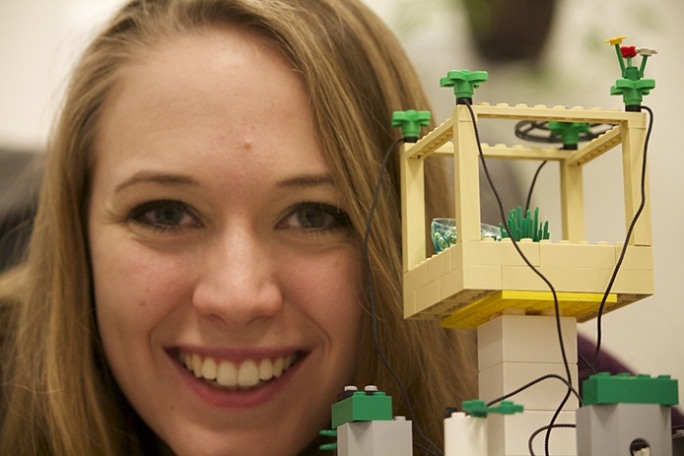 Vortherms is exploring what interventions, such as Lego Serious Play, improvisation or traveling, might improve empathic capacity in engineers. “She’s out on the edge of her discipline,” says Seager. Another challenge to retaining women in engineering is negative stereotyping. On the one hand, the competency of women, especially of those who wear heels and makeup, is sometimes questioned in the traditionally male-dominated engineering world, and on the other, scientists and engineers are assumed to live out their workdays alone in a lab. Vortherms is challenging these stereotypes by bringing together her experiences from both worlds. In the engineering world, she hopes her research will demonstrate that effective engineering requires a strong connection with people and society, much like the pageant promotes. On the pageant side, she’s integrated STEM (science, technology, engineering and math) throughout her pageant experience, adopting STEM education reform as her pageant platform. For the talent portion, she performed a monologue from the play "Proof," by David Auburn, which brings “math and the human condition together,” says Vortherms. Vortherms will continue to integrate STEM as she competes for Miss Arizona in June. The winner of that competition will compete for the title of Miss America.